Our Saturdays are the days when we can really solar cook since we are all home and free from the obligations of employment and school. 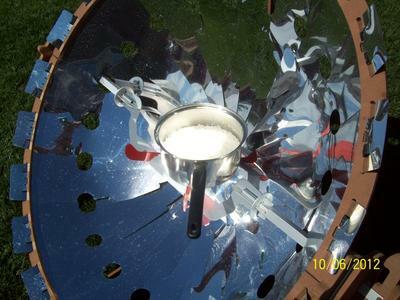 I still solar cook almost ever day of the week, but it is usually something quick, easy, or simple. But, on the weekend we will sometimes cook as many as six to ten different foods. Today we got sort of a late start, but with a couple of hours still remaining before lunch time I decided to do something easy and quick so I pulled out of the freezer the box of orange sauce and chicken nuggets mix we get from Costco. 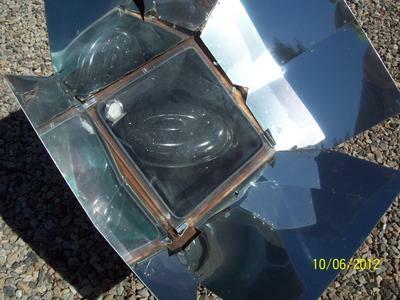 I had already place two of our solar ovens out to preheat and had set up the Solar Burner Parabolic. I put the chicken inside of our mid size oval roaster and placed it into the Global Sun Oven and after about an hour of cooking I then added the thawed out orange sauce to the chicken and returned it to the oven. While I was outside working I also put one sausage patty into a small cast iron frying pan and placed it on the Cookup200 and let it simmer for some time since this parabolic is not quite as intensely hot as the larger Solar Burner. This was my breakfast. I then proceeded to pop up my customary batch of solar cooked popcorn for the weekend, this I do each Saturday for use later in the evening or on Sunday. As soon as I finished with the popcorn it was time to cook the rice that would accompany the chicken. I placed four cups of water in a pan to heat on the Solar Burner and within a few minutes it was boiling and I was able to add the two cups of rice. 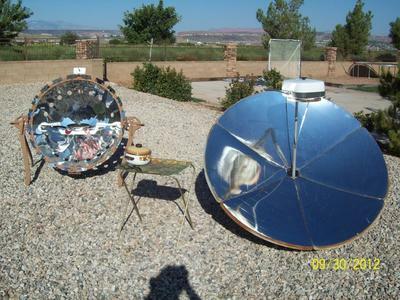 I let it cook for about 10 minute and then I moved it to the smaller Cookup200 parabolic so that it would cook at a lower, more simmering temperature as opposed to the hotter and more scorching temperature of the Solar Burner. Ten minutes more on the CK200 finished the rice and we sat down to a quick afternoon lunch. Lately, due to our busy schedules, we find ourselves using our solar cookers for more quick, simple and easy "fast food" type meals. 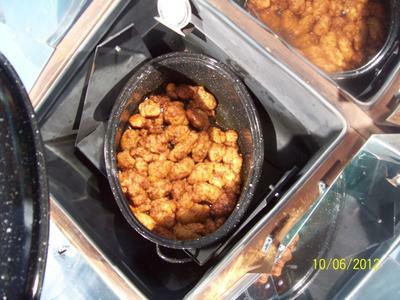 We like home made and from scratch, but either way, we always use our solar cookers to do the cooking.